Three thoughts on the Jazz’s 92-84 loss to the Memphis Grizzlies from Salt Lake Tribune Jazz beat writer Andy Larsen. Tonight’s game might be the closest facsimile of ’90s basketball you’ll see in 2018. Memphis aggressively helped, packed the paint, and dared the Jazz to figure it out. They couldn’t. 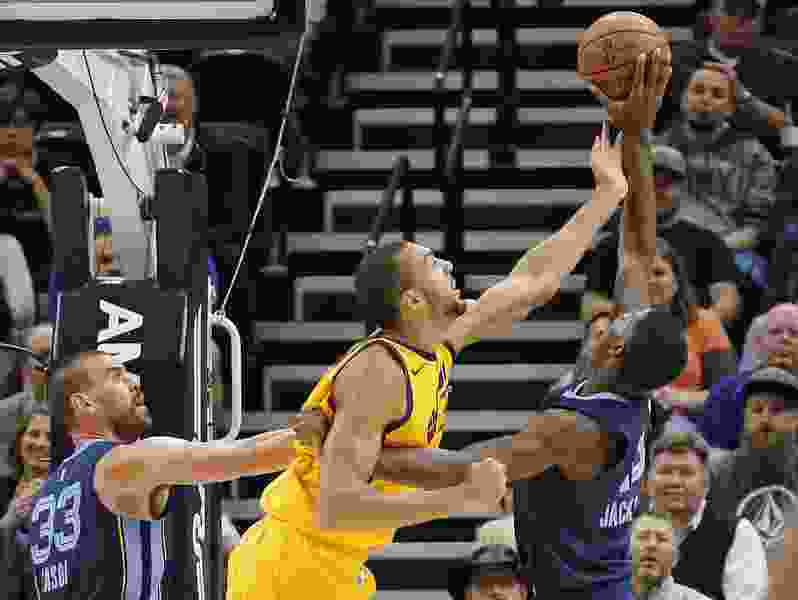 It’s a strategy that makes sense: as on fire as the Jazz were from three in the first half on Friday against the Warriors, the real biggest offensive weapon that the Jazz have is their rolling big men, Derrick Favors and Rudy Gobert. So Memphis coach J.B Bickerstaff told his big men to stay between the roll man and the basket, taking away the Jazz’s favorite option, the high pass. Meanwhile, his perimeter defenders sunk into the paint, getting a lot of traffic involved. So that gave the Jazz’s ballhandlers the option to take the in-between shot, or to pass it out and get an open three or the option to start the blender. They did take a lot of those in-between floaters and layups: 13 of them in fact, more than they had taken in the previous two games combined. They made only one of them. Here’s the whole playlist, in case you’re curious or masochistic. Royce O’Neale is open on the wing. Pass it out. To be clear, Exum wasn’t the only one making this mistake: Ricky Rubio, Joe Ingles, and Donovan Mitchell all did as well. Now, yeah, the Jazz weren’t shooting well from outside either, they only made eight of 32 threes. But even with that math, your points per possession is still a lot better taking the 3-point shot than going 1-13 on goofy floaters. That’s especially true when Snyder improved the math by putting in the Jazz’s best shooters: Grayson Allen, Mitchell, Ingles, Jae Crowder, and Gobert was the Jazz’s finishing lineup, thanks to the 3-point percentages it offered. Allen and Ingles ended up with the Jazz’s only positive plus-minuses tonight, and I don’t think that’s a fluke. Usually, the Jazz are a lot better at making that right read, and that is what was so discouraging to Quin Snyder: they weren’t following their offensive principles. While the Jazz’s offense was abysmal, with only an 88 offensive rating, their defense was actually quite good, allowing Memphis only 96 points per 100 possessions. Really, the defense kept the Jazz in the game. That number’s especially promising when you consider how much easier defense can be when you’re scoring on the offensive end: the opponent has to take the ball out at the baseline every time. But despite 15 Jazz turnovers, the Grizzlies only got four fast break points. And of course, the Grizzlies only shot 36.9 percent. That will win you 95 percent of games, just not the ones where you’re abjectly terrible with the ball in your hands. It was a decent test for the Jazz’s base style of defense. Golden State is a unique team to play against because of their 3-point shooting, and the Jazz kind of sell out to stop the outside shot. Quite frankly, despite the 124 points against, I thought the Jazz’s defense was quite good against the Warriors, they just made many incredibly tough shots. Against Memphis, the Jazz can do their normal stuff: fall back into the paint, funnel players to Gobert, and force missed shots. It worked. The Jazz weren’t always this defensively flexible, though. Back when Snyder was still establishing the defensive system that would turn the Jazz from the worst defensive team in the league to its best, he played their base defense in essentially every game. Because the Jazz were far from contention, it made more sense to establish base principles and habits rather than change everything to stop one team. Houston’s going to be an interesting test with regards to this, too: conceptually, the Jazz’s defense should work really well against them, especially while mid-range artist Chris Paul is suspended. I’m curious to see if they can keep it going and really re-establish the identity that made them special last season. Here’s another thing that doesn’t help when you can’t make any of your shots: missing out on loose balls. The Jazz’s defensive rebounding was fine: they got 77 percent of Memphis' misses, which is an above-average percentage. But of 16 plays the NBA defined as “loose balls," Memphis got 13 of them, and the Jazz got three. All three of those came from the Jazz’s starting lineup, the bench picked up none while Memphis' got five. Some of that, to be honest, is sheer luck. If a loose ball ends up closer to team A, team A is going to be favored to get it no matter how much more team B might want the ball. But it’s still an ugly number for a coach to see; and of course, a few extra possessions might have changed the game (though probably not enough for the Jazz to win, given how poorly the Jazz were playing offensively). I wonder if that was another reason Grayson Allen was placed into the game late: besides his good 3-point shooting, Allen’s well-known for being a monster around loose balls, ending up with many of them. That might win him more playing time over Alec Burks, who can be a very good rebounder, but is not a brilliant “loose ball" effort guy.